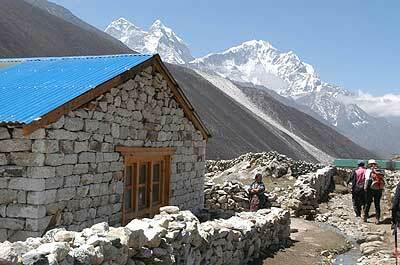 It is acclimatization day at 14,000 feet in Dingboche. The greatest thing about acclimatization day, when we take a full day off to allow our bodies to adjust, to rest before we move higher. The greatest thing about an acclimatization day is that when you wake up in the morning you are in the same bed that you are going to use again that night, you don’t have to pack your duffel bag to put on a yak first thing in the morning. 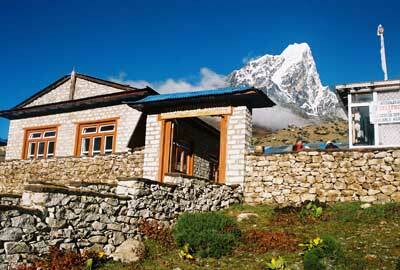 We realized that we are also in a beautiful spot here in Dingboche. After breakfast, most of us took the day off; as a matter of fact, Brad and Dan, our 2 most enthusiastic hikers, decided to just let their bodies adjust, they sat around the lodge all day, reading, talking to the sherpas and visiting. Shelley, Richard, Katherine, myself and some sherpas climbed to over 15,200 feet this morning. Wes, whose appetite hasn’t been very good, decided to stick close to the lodge as well. But I noticed when we came back for lunch, he was doing fine and his appetite is hanging in there, he is taking care of it better and had part of big jar of Pringles, potato chips, before lunch; so Wes is looking good and I think a rest day is going to do him a lot of good. In the afternoon, Shelley, Mark and myself walked over the ridge to the village of Pheriche. We had an amazing treat over there, we ran into some sherpa friends and someone ran and said a baby horse has just been born, not 15 minutes ago. So we went over and we saw the young colt, less than one half hour old, standing next to his mother. It was really an amazing scene. One of the [lost transmission] of this trek, especially as we get higher, there are a lot of Everest climbers around, every lodge we go into, it is full of Everest summit aspirants, people who are hoping to reach the summit of Everest soon, taking a final rest before they move up the mountain for their final summit attempt. We‘ve met a lot of great people from all over the world who are attempting the mountain this year, we wish them well and we are looking forward to trekking to base camp, closer to base camp with them, as they go back up Everest and we go for a visit to base camp and our view of the Khumbu Icefall and the upper part of the Khumbu valley.